Clay target shooting is a terrific sport that can be enjoyed by all ages, from eight years old to eighty; even people who have never held any kind of gun before can be shooting a moving target out of the sky with just a few minutes of our informal, but expert, instruction. Those who don't usually enjoy other sports can find that clay shooting is an activity they derive tremendous satisfaction from. Put simply, blasting a dozen or so flying targets into pieces makes you feel you can achieve anything! 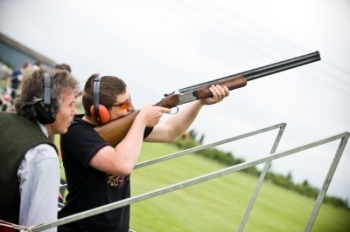 Whether you are staging an event for 500 people, or just a stag or hen party entertainment for a few friends, you can guarantee that your guests will be talking about the thrill of firing a twin-barrelled shotgun for a long while afterwards. As one of the country's leading and most experienced providers of shotgun tuition to first-time shooters, Erik Aaron Shooting can provide all the equipment, expertise and organisation you need to make sure your event is enjoyed, in perfect safety, by every one of your guests. No specialist clothing is needed so anyone who wants to step up and shoot some clays will be able to do so. There is no need to obtain any kind of licence before using a shotgun when under supervision at a licensed venue, i.e. as with Erik Aaron Shooting. Just turn up, listen to the safety talk, and get started. It's absolutely ideal for stag entertainments and similar events. If your guests have some clay or field shooting experience already, they may well enjoy taking on some of the more challenging trajectories and flights we can set the traps up for, perhaps simulating the paths of a variety of live birds or launching in the UK or Olympic competition formats. 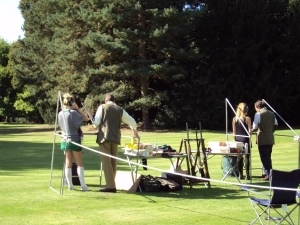 As well as the more obviously necessary equipment such as a range of suitable guns, shooting cages and cartridges we also provide all the peripherals and accessories (such as ear protection, remote trap controllers, signage and safety fencing) needed to ensure your guests are protected and comfortable. 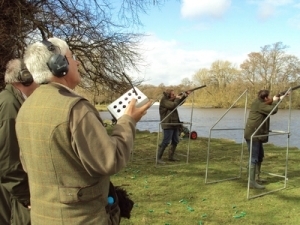 Clays can, if requested, be fired using a sophisticated wireless 'flurry control' that will deliver a consistent set of target flights for successive groups of shooters. Some of our instructors are coaches of national standing (and many-time winners of prestigious championships themselves), able to pass on insights on everything from basic gun handling to tournament psychology. Their love of shooting as a competitive sport and years of experience mean that even those who have shot many times before will enjoy their day, and the chance to hone their shooting technique with the very best of professional advice on hand. In short, everyone - from beginner to seasoned enthusiast - enjoys their shooting and gets something out of it. We have excellent relationships with the relevant authorities and can help speed your application for a temporary shooting ground licence if one is required.